I first heard of the Spanish gourmet tinned fish industry (at the time with some skepticism) on a previous trip to Galicia in Northwestern Spain, a fantastic trip that I featured in The London Foodie (see the post here). My curiosity was again piqued when I was invited by ANFACO (Asociación Nacional de Fabricantes de Conservas de Pescados – The National Association of Preserved Fish Producers) to return to Vigo in Galicia and learn all about the Spanish canned fish industry, but more on that later. One of my favourite regions in Spain, Galicia is relatively undiscovered by the Brits, but it has so much going for it - most importantly top quality fish, seafood and wines. Vigo is home to the largest fishing port in the world, attracting fishing boats from across the seas arriving at the city to sell their catch, or as a starting point en route to other European destinations. On my latest visit, the port was bustling with numerous auctions taking place as we got there in the wee hours. So fresh, good quality fish and seafood is in every Galician’s DNA – it is served and consumed from the most modest of eateries to Michelin-starred restaurants, making Spain one of the top 10 countries for their consumption of fish. We experienced great fish and seafood everywhere we visited in Vigo and the surrounding areas. One restaurant to note was the Pigmalion Tavern in Vigo, a simple restaurant with a few outdoor tables close to the sea and where a lot of the local fishermen eat. We had some fantastic grilled razor clams here and a glass of super-chilled Galician Vermouth (the drink of choice with Galician seafood I am told). The grilled fish platter with potatoes and padron peppers was also excellent. The Pigmalion Tavern offers a fabulous value 3-course lunch menu with options such as gazpacho or home-made croquetas for starters, and paella mista or bacalao for main course, as well as bread, a drink and a dessert, all for €12. I enjoyed this restaurant and recommend it. We also had the opportunity to visit some of the gorgeous coastal towns close to Vigo. Only a thirty-minute drive is Baiona – a beautiful seaside town with lovely beaches and a long promenade. The town is known for its many tapas bars and quaint architecture, and it is a holiday destination for many locals from Vigo. Baiona is also home to the beautiful Parador Baiona Hotel Conde de Gondomar. State-owned, the Paradores de Turismo de España run a chain of spectacular hotels, often in restored historic properties like medieval castles, Renaissance palaces or former convents. Today there are 93 paradors across the country, often in spectacular locations, and they are always worth looking out for. The Parador Baiona Hotel Conde de Gondomar is set on the top of a steep hill overlooking the bay with the most commanding views, and is also a great spot for lunch and cocktails. Further along the coast is A Guarda, another picturesque seaside town where we stopped for dinner. We had one of the best meals here at Restaurante Bitadorna, a seafood restaurant which is right on the promenade. They offer a 10-dish tasting menu for €55, but we went à la carte. It was great starting with a big platter of percebes (barnacles), and some local vermouth. We also enjoyed some delectable grilled scallops with a brunoise of carrot, celery and courgette, and clams in pumpkin sauce. The razor clams were just too good to resist and we had another big platter. This is not a budget eatery (seafood seldom is), but with so many choices along the promenade, this is a great restaurant with fantastic seafood and worth pushing the boat out a little. Another good reason to visit the region is their wine. The area of Rias Baixas in Galicia, home to the best Albariño wines in the world, has its own DO (Denominacion de Origen). Great wines are also made from other less known native grapes including Caiño Blanco (and Tinto), Loureiro and even Torrontes, as I discovered during a fantastic tasting at Terras Gauda Winery. This relatively young, 25-year old winery produces four different white wines using Albariño, Loureiro and Caiño Blanco priced from €10 to €31. The wines were well made and it was interesting to experience other regional grapes beyond my much-loved Albariño. Terra Gauda offers enotourism packages including a vineyard tour and tasting, local accommodation and fine dining. For more details, see their website in Travel Essentials below. The perception of tinned food in the UK, the stuff that granddad ate with slices of white bread and stewed tea, contrasts significantly with how it is in other parts of the world. In Spain, gourmet tinned fish and seafood is readily available, the quality is superior to anywhere else I have seen, and it is definitely not frowned upon. As I was to discover on this trip, you can find some artisan boutique producers of tinned fish and seafood, with canned delicacies including anything from the more popular sardines to octopus, Icelandic smoked cod livers, and Galician sea urchin caviar, to name just a few. My experience of the Spanish fish canning industry started with a visit to ANFACO (The National Association of Preserved Fish Producers). Canned fish in Spain is such an important industry that it was remarkable to learn it even has its own association to look after the interests of its members, spread the word on the quality of the country’s fish canning, and run state of the art laboratories for quality control. The association is also home to a fascinating museum on the development of fish canning in the country, cataloguing the background to this method of food preservation from its start to the present day. The canning process dates back to the late eighteenth century France, when the Emperor Napoleon Bonaparte, concerned about keeping his armies fed, offered a cash prize to whoever could develop a reliable method of food preservation. Nicholas Appert conceived the idea of preserving food in bottles like wine. After 15 years of experimentation he realized that if food is sufficiently heated and sealed in an airtight container, it would not spoil. An Englishman, Peter Durand, took the process one step further, and developed a method of sealing food in unbreakable containers, which led to the opening of the world’s first commercial canning factory in England in 1813. More than 50 years later, Louis Pasteur provided the explanation for canning’s effectiveness, when he was able to demonstrate that the growth of microorganisms is the cause of food spoilage. No additives are necessary to preserve canned food. You put the food in a tin, add some sauce, water or oil, seal and heat to kill off the germs inside. Having visited some of the small family canning businesses that make these products in Galicia, it was striking to see how much work and care goes into them. One of these factories was the Real Conservera Española, a family run business, where the Peñas have been selling their preserved fish since 1920. We were shown around by the owner himself, who among other things told us that he often gets calls from people wanting to buy 20 year old or older tins of his fish and seafood. Like a good wine, good fish and seafood matures in the tin, and these vintage tins are highly prized. Here the selection criteria for the fish and seafood used are high, as is the production method – fish are trimmed and immaculately arranged in the tins by hand, before being sealed and pasteurised. We had a quick tasting of four of their products after the tour – mackerel (€6 for 150g), sardines (€7 for 120g), mussels (€8 for 85g), and small scallops (€7 for 85g). Particularly excellent were the small scallops in tomato sauce that surprisingly still retained a firm texture, and were beautifully seasoned. Equally good were the mussels in an escabeche sauce containing vinegar and olive oil sauce. The dish had a striking red colour, with soft textured mussels and a flavourful sauce. Of all the canning plants we visited on this trip, this had by far the best tinned fish and seafood I tried, they are the Rolls Royce of the fish canning industry in Spain. They were so delicious that I brought a few packs to try at home. A larger and more commercial venture than Real Conservera Española, here we again saw a very impressive production line, with a number of women trimming octopus tentacles and placing them carefully in tins. Again it was amazing to see how immaculately clean everything was, and how labour-intensive the process is. The produce is stunningly presented in the tins, and even the exterior looks like a work of art. The packaging was elegant, looking more like designer cosmetics than fish, either all in white, or in gold and black. To taste, we had the baby squid (€5 for 110g), the octopus (€12 for 130g), and sardines (€6 for 4 pieces). I wish we had been offered something a little more exciting than sardines, but this is what was available for tasting – unfortunately I found them to have a mushy texture, with scales still present and little discernable flavour. Better however were the octopus and baby squid in olive oil. Both had a fine firm texture, although again somewhat lacking in seasoning. Rather than being served on their own, I think they would make a brilliant addition to a salad or pasta dish. A family run business started by a local woman after she divorced, Linamar today specializes in mussels. She discovered that mussels were not cleaned or purified before being sold to the customer, and so she set about finding a method to achieve this and some clever packaging to keep alive for days afterwards. At Linamar, mussels are cleaned for at least twelve hours in purified free-flowing seawater and algae to expel all toxins and dirt. Then they are washed and packed in airtight containers filled with carbon dioxide and oxygen so that the mussels can continue breathing and living for up to 10 days. The mussels are live, clean, have no additives or preservatives, and can be taken straight from the fridge to the cooking pot without any further preparation. I have never come across this concept of off the shelf live mussels before, and was fascinated by what the owner had achieved. In addition to this, cleaned mussels are also sold in the more traditional netting bags, or pasteurized and vacuum packed, or in microwaveable packaging with various sauces like Provençal or curry. It takes me hours to prepare mussels for my supperclub each morning, and it’s a messy job. It would be great to have access to something similar in the UK. We spent a very enjoyable evening with the charming local food blogger Carmen Albo of GuisandomeLaVida.com for a cookery demonstration using tinned fish and seafood. I discovered that top quality canned seafood makes for a fantastic canapé, simply served on top of a cracker or potato crisp, accompanied by a chilled glass of Spanish Vermouth. What a great way to start a party, and definitely a conversation starter in the UK! Carmen prepared a range of lovely dishes with her no-nonsense approach to cooking -¬ everything she prepared was easy to put together, well presented and tasted delicious. I loved her Salmorejo, a chilled soup from Cordoba, Andalucia, made from tomatoes, bread, vinegar and olive oil, topped with chopped eggs and slices of tinned white tuna belly. Equally good was her guacamole-style dish with roughly mashed avocado, spring onions, coriander, tomatoes and canned cockles with a good refreshing drizzle of lime juice, served in avocado shells. Crispy tortillas topped with ratatouille, tinned sardines and fresh mint leaves had a great melange of textures and flavours. Carmen’s deconstructed Russian salad was also gorgeously presented in individual glass tumblers – with layers of cubed potatoes, carrots, peas, tinned tuna all topped with mayonnaise and tinned roe, it also tasted fresh and delicious. On returning to the UK I decided to investigate the subject further. 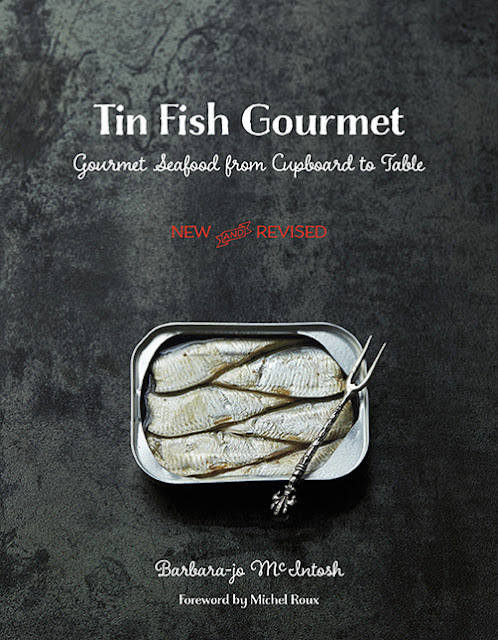 As well as online research, I also purchased the cookbook ‘Tin Fish Gourmet’ by Barbara-Jo McIntosh (available from Amazon at £18.99). 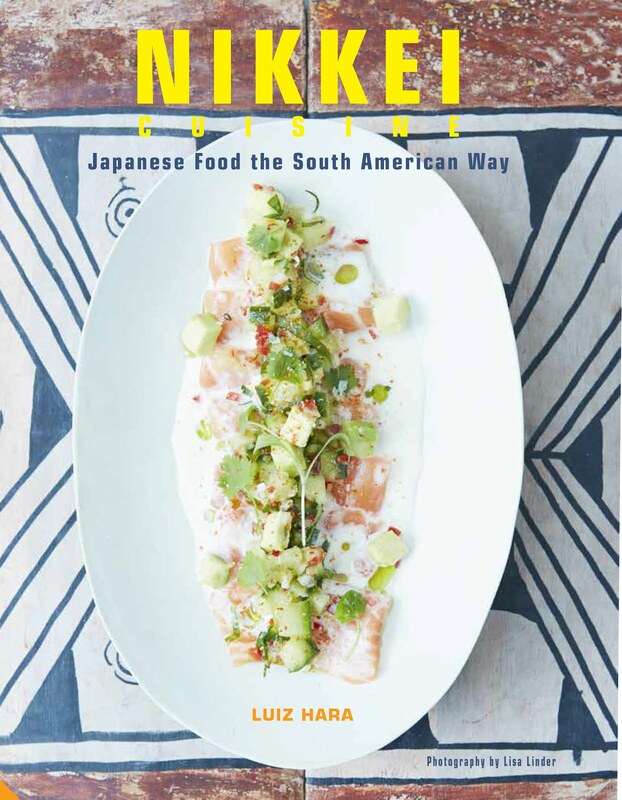 This innovative, if somewhat daring, cookbook features ideas not only for tinned tuna and salmon but also for other more interesting seafood like oysters, prawns and crab. There are sophisticated versions of traditional dishes as well as contemporary recipes like clam & Fontina pizza, and shiitake mushrooms stuffed with crabmeat. This is a well written and designed book and I will be trying some of its recipes. I discovered that Hugh Fearnley-Whittingstall has been championing tinned fish for years in the UK. His favourites are the Pilchard Works from Cornwall, which are quite collectable because of the traditional local paintings used to decorate them (Waitrose from £2 a tin) and Fish 4 Ever (available from Ocado for under £4). I also came across a series of mouthwatering recipes by Hugh Fearnley-Whittingstall using tinned fish on the Guardian’s website, including a delicious spaghetti with anchovies, chilli and garlic I am dying to try. You can read these recipes here. If you would like to purchase and try some of these gourmet Spanish tinned goods, I recommend reputable Spanish stores in London such as Brindisa or R Garcia & Sons, or the food halls at Selfridges and Harrods. Or keep your eyes peeled on your next trip to Spain – supermarkets have aisles packed full of them. I was really inspired by what I learned and tasted in Galicia, and the possibility of bringing tinned fish and seafood into my cooking. I hope it will provide you with some inspiration too, and challenge some food prejudices; it has certainly challenged mine! This visit to Galicia was sponsored by ANFACO (The National Association of Preserved Fish Producers), for more information about the Spanish tinned fish industry, please visit their website here. 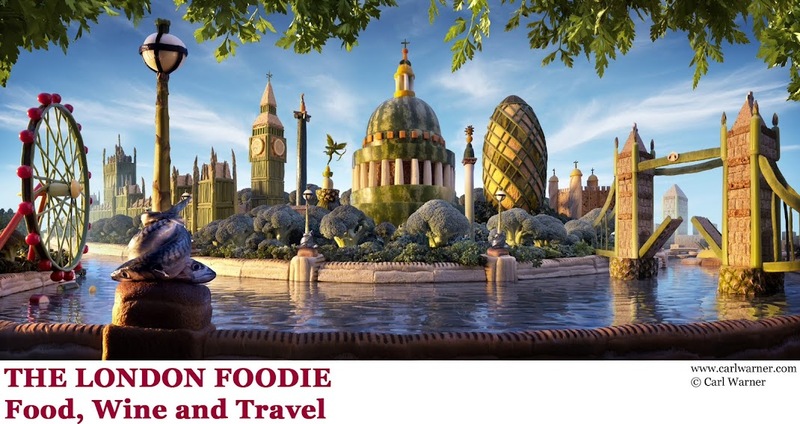 The London Foodie maintains full editorial control of the content published on this site as always. I love percebes: I eat tons of them every time I am in Portugal. Galizia was already in my radar but it has jumped on top together with Basque Country after reading this. Thank you Muriel! I highly recommend a visit to Galicia, have a great time in Cuba btw!